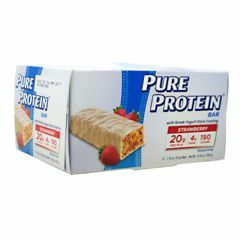 AllegroMedical.com presents The PURE PROTEIN Pure Protein Bar - Greek Yogurt Strawberry Protein Bar Gluten Free. Brand new from Pure Protein - these unique and delicious bars feature Greek Yogurt style coating and real pieces of strawberry for a truly amazing taste! Plus, they're packed with 20 grams of protein, an excellent source of calcium, and 15 vitamins and minerals. Pure Protein - the delicious way to power your possibilities! Protein Blend (Whey Protein Concentrate, Whey Protein Isolate, Milk Protein Isolate), Greek Yogurt Style Coating (Maltitol, Fractionated Palm Kernel Oil, Whey Protein Concentrate, Greek Yogurt Style Powder, Nonfat Dry Milk, Soy Lecithin, Lactic Acid, Natural Flavor), Hydrolyzed Collagen, Glycerin, Soy Crisps (Soy Protein Isolate, Tapioca Starch, Soy Lecithin, Salt), Strawberry Pieces (Sugar, Corn Starch, Dried Strawberries, Fructose, Canola Oil, Dextrose, Corn Syrup Solids, Natural Color [fruit juice concentrates], Natural Flavor, Citric Acid, Cellulose Gum), Maltitol Syrup, Water, Maltodextrin, Soy Protein Isolate, Natural Flavors, Canola Oil, Vitamin and Mineral Blend (Calcium Carbonate, Ascorbic Acid, d-Alpha Tocopheryl Acetate, Niacinamide, Zinc Oxide, Biotin, Copper Gluconate, d-Calcium Pantothenate, Potassium Iodide, Vitamin A Palmitate, Tricalcium Phosphate, Pyridoxine Hydrochloride, Thiamin Mononitrate, Riboflavin, Folic Acid, Cyanocobalamin), Citric Acid, Sucralose, Soy Lecithin, Peanut Flour, Almond Butter. Contains milk, soy, peanut and tree nut (almond) ingredients.